Last week we welcomed over 50 individuals from colleges and universities across all of Scotland to our Think Positive Launch Event! The day featured workshops from our partners, ASH Scotland and Scottish Student Sport (SSS), as well as NUS Scotland. 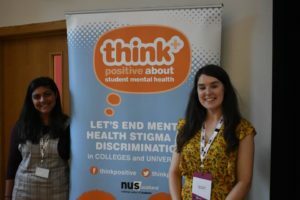 The agenda was packed with interesting topics of discussion, from the negative correlation between smoking and mental health, delivered by ASH Scotland, to NUS Scotland’s recent FOI research into student mental health in Scotland. We were also pleased to welcome speakers from institutions who are taking part in our projects! It was a fantastic opportunity for those attending on the day to get to know more about Think Positive (and the team!) in more depth and learn about how the Healthy Body Healthy Mind Awards and Student Mental Health Agreement Projects can help institutions move towards being more accessible and inclusive. We had a lot of fun meeting everyone and getting to know more about your college/university! We hope you had a great time too.